I write about working class lives, so being allocated a swan feather muff challenged me. Weren’t swans the preserve of royalty? 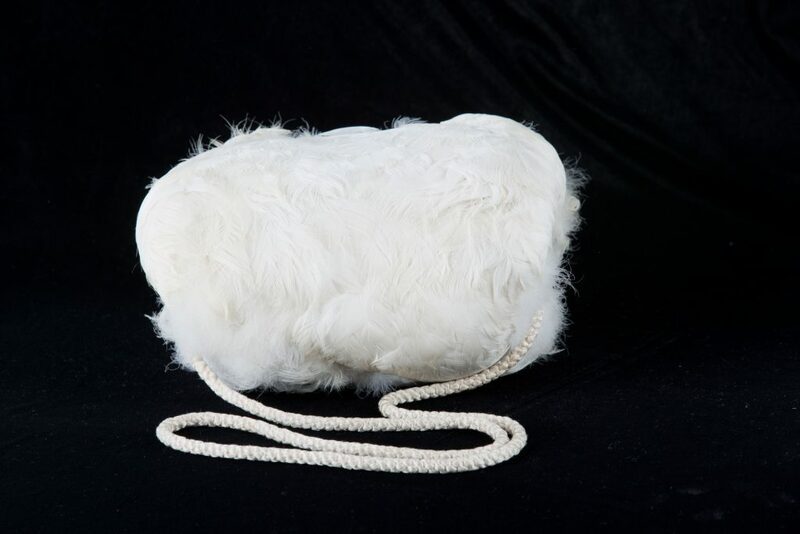 Museum curator Lyn Wall described the muff as made from swan down with a satin lining. It’s padded, and surprisingly heavy. It dates from 1860 – a beautifully crafted luxury item from a time of huge socio-economic disparity. Research reminded me of the privileged child from Victorian Christmas card illustrations: well wrapped up, skating, hands in a muff. I thought about swans. Then I remembered a photo of my son-in-law holding a pigeon he’d charmed into his hands. My children used to enjoy a folk tale in which an elderly woman brought winter by shaking her pillows till the feathers flew. I imagined big feathery flakes against a black sky, and a line came to me: white dove and snow feathers fly. In my sestude, a young servant stands by a frozen loch, watching her ‘lady’ skate. The lady’s hands are cosseted inside the remains of a swan while the servant holds a living bird. With sudden awareness, the servant sets her bird free. I used repetition of white to indicate winter, but also innocence as both characters are children.